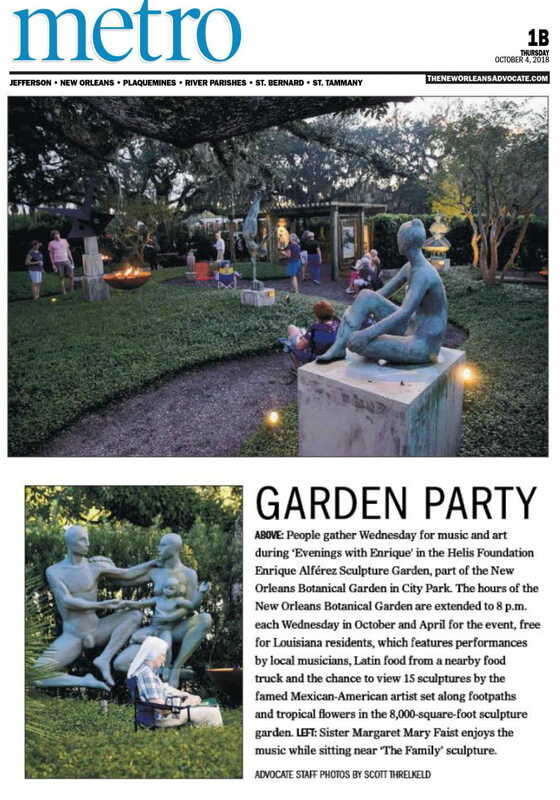 ABOVE: People gather Wednesday for music and art during ‘Evenings with Enrique’ in the Helis Foundation Enrique Alférez Sculpture Garden, part of the New Orleans Botanical Garden in City Park. The hours of the New Orleans Botanical Garden are extended to 8 p.m. each Wednesday in October and April for the event, free for Louisiana residents, which features performances by local musicians, Latin food from a nearby food truck and the chance to view 15 sculptures by the famed Mexican-American artist set along footpaths and tropical flowers in the 8,000-square-foot sculpture garden. LEFT: Sister Margaret Mary Faist enjoys the music while sitting near ‘The Family’ sculpture.